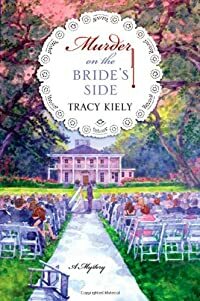 Murder on the Bride's Side by Tracy Kiely, a Mysterious Review. Review: Amateur sleuth Elizabeth Parker is the maid-of-honor at her best friend Bridget's wedding, but it's the murder of a hated relative that gets all the attention in Murder on the Bride's Side, the second mystery in this series by Tracy Kiely. The wedding is being held at Bridget's grandmother's estate. Grandmother Elsie has a fondness for predictions, and as three seagulls fly overhead, she remarks, "A death is coming." Sure enough, following the ceremony, Elizabeth finds Bridget's Aunt Roni stabbed to death, her body under a blanket on the terrace, her $200,000 necklace missing. No one is shedding any tears, however, as she was a mean-spirited woman who married Bridget's wealthy uncle Avery solely for his money … though he seems blissfully unaware. The suspects are numerous — nearly everyone present had motive and opportunity — but the police focus their attention initially on Avery's two children from a previous marriage, Megan and Harry, with the latter being their prime suspect. No one believes Harry capable of such an act, least of all Elizabeth, who takes it upon herself to prove Harry's innocence … even if she isn't quite sure where to start. The murder mystery plot of Murder on the Bride's Side seems almost secondary to the antics of the delightful cast of characters that populate this story. Not only must Elizabeth take on the role of Nancy Drew here, but wait … is it her imagination or is her new boyfriend Peter spending just a little too much time with the attractive caterer? It's unlikely they're swapping recipes. Weddings are stressful under the best of circumstances; toss in a murder and the tension really escalates, bringing out the best — and more often the worst — in people. The banter between characters is creatively written and witty, the genteel Southern traditions given a modern makeover. And when the focus returns to who killed Aunt Roni and why, how it all plays out comes as an unexpected surprise. Special thanks to guest reviewer Betty of The Betz Review for contributing her review of Murder on the Bride's Side. Acknowledgment: Minotaur Books provided a copy of Murder on the Bride's Side for this review.